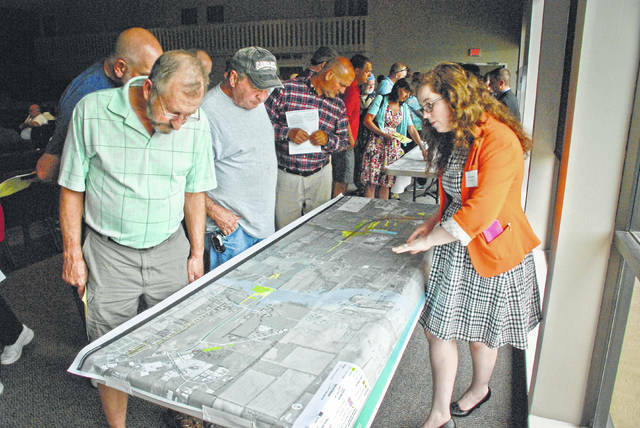 Before July’s presentation of the proposed $162 million, multi-phase, I-71 US 36/ State Route 37 interchange improvement project, an open forum was conducted for the community to view plans and ask questions. ODOT recently approved $10 million in funding for the project. The Ohio Department of Transportation’s Transportation Review Advisory Council (TRAC) approved $10 million in funds for the the new interchange on Interstate 71 south of US 36/SR 37 in Delaware County, a $162 million, multi-phase construction project. The funding is part of a $55 million total investment for 10 new major projects that was approved Dec. 14. Three public hearings were held by ODOT on the I-71 interchange. The first was conducted in April 2016 for public feedback on three alternatives for the project. The second was in the fall of 2016 to share the preferred alternative and project details. The last was held in July 2017 to obtain public comments on the project. During July’s public hearing, Ohio Department of Transportation Project Manager Steve Fellenger said the improvements to the I-71 corridor will be a great benefit for Delaware County. He said the project is driven by safety issues due to traffic congestion at peak times. The existing diamond interchange at I-71 and U.S. 36/SR 37 was constructed over 40 years ago and is the only interstate access in the central and northern part of Delaware County. A safety study was initiated by ODOT in 2003 to analyze the high crash rates around the interchange and recommended modifications to lane configurations at the interchange and access management along U.S. 36/SR 37. ODOT completed a project to address safety issues in 2012. Addressing the timeline of the project, Fellenger said there has been concern about it taking 17 years to complete. He said the work will be done in phases and there would not be continuous work for 17 years. TRAC’s 2018-2021 program list includes: $18 million for the I-475/Dorr Street interchange in Lucas County, $6 million for construction of new bridge over the Maumee River on State Route 110 in Henry County, $8.7 million for the addition of a third lane on US 35 from Whalen Boulevard in Dayton east to I-675 in Montgomery County, and $6 million for a deceleration lane on I-71 to State Route 176 in Cuyahoga County. The TRAC draft list includes recommendations for two new projects supported by $250 million in Turnpike Bonds: $160 million for the reconstruction and widening of I-75 in Lucas County and $90 million for the reconstruction of I-75 and widening of the bridge over the Maumee River. This entry was tagged $162 Million, I-71 US 36/State Route 37, Ohio Department of Transportation, TRAC. Bookmark the permalink.